It's the weekend again, and today's post is full of fun color inspiration, and techniques. 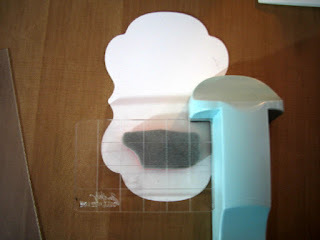 In addition I have a small tutuorial on how to use what's becoming my current favorite tool, the Stamp-a-ma-gig! It's so helpful when you want to make sure your stamp positioning is always right on. 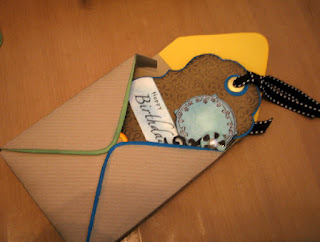 First of all here's my project, a set of tags and a cute gift box to put them in! 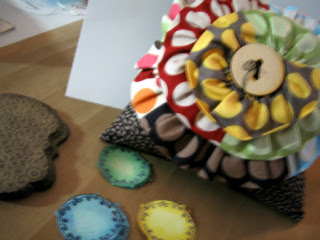 The colors for my tags were inspired by a pillow I made during CKU- I love the colors and how cheery the combination made me feel. 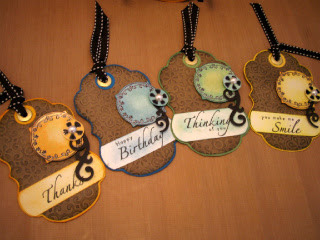 Hopefully that is the feeling these tags will bring to my lucky recipient as well! Here are some other views of the box itself- open and closed. This box was simple since I just had to use my Silhouette to cut and size to fit my tags. I lined each flap with color and the closure is a simple band. 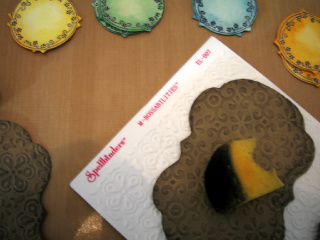 Mimicing the tag shape and another Fashionable framed stamped and ink embossed for the center. The decorative band slides off to allow eacy access from the top - where inside there is just enough room for 8 tags. To create the tags, I embossed and diecut the tag with a Spellbinder Label set, and used a Spellbinder textures folder for additional dry embossed affects. Black Soot from Ranger Distress inks were used to bring out the raised areas. 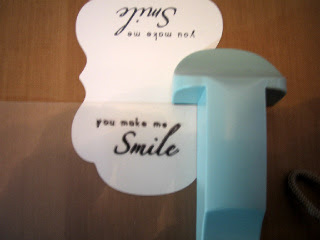 Each tag, has a different phrase stamped on it from The Rubber Cafe's - Fabulous Phrases set. 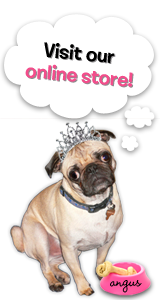 Giving you a tag for any occasion! To guarantee the accurate placement of my phrase, I used my Stamp-a-ma-jig. 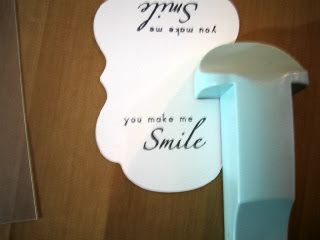 Even with a clear block I find these phrases are easier to line up for perfect placement if I use my Stamp-a-ma-jig. Here's a quick tutorial. 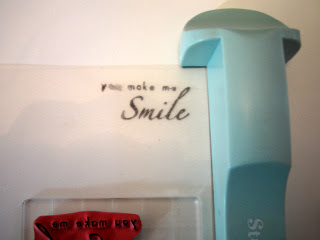 You can use this with phrases, or image stamps, for plain stamping or special masking techniques. Overall a great tool when accuracy really counts! 1. 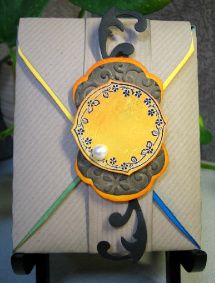 Start by taking the plastic template provided with your Stamp-a-ma-jig. And line up the corner to your tool, I took my stamp mounted on a clear grid block, which is also lined up with the corner of the tool and stamped on the plastic guide. (Don't use Sta-zon when creating this guide, it does not clean off the plastic template well) how perfect the coverage is not important you just want to get a clear enough image for placement. 2. Now take your plastic stamped template and place it over your paper and line it up where you want your phrase or image to be. 3. Once the template is placed where you want, take the Stamp-a-ma-jig and once again, align the corner of the plastic template inside the corner of the tool. Oila! A perfectly placed and aligned image! 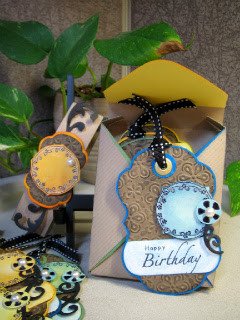 To embellish my tags, I used the flourish and simple flower from The Fashionable Frames set, stamping them both on Glossy White paper, with Black Archival ink. I used clear embossing powder, providing a simple resist technique so I could rub Distress inks with a sponge over the entire frame. After I fussy cut out the frames I popped them up with foam dimensional adhesives directly to the edge of each tag. The simple black flower was punched with a 3/4" circle punch, and popped again with another dimensional pop-dot. In the center I adhered a pearl embellsihment. Here's a closeup view of each tag. 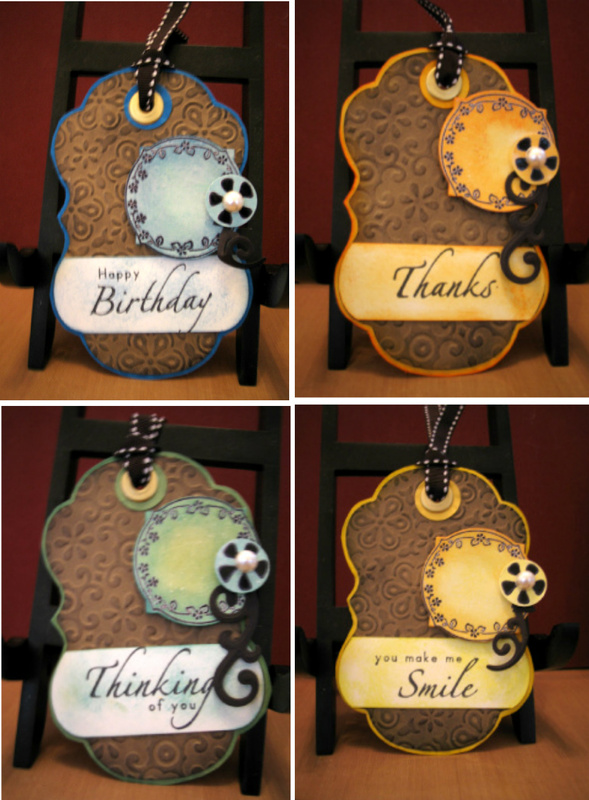 I made 2 each of 4 different colors for a total of 8 Fabulous tags! 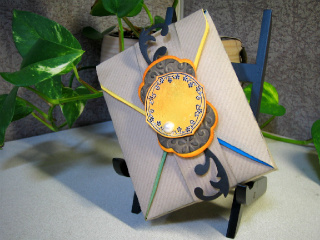 A small black flourish from a Spellbinder die set, was added as a finishing touch! Well that's it, Inspiration, color, technique and a tool-tip all in one! Love these colorful, beautiful pieces! Wonderful job Karen!